The fragile three-day-old Syrian cease-fire negotiated by the U.S. and Russia appears increasingly troubled with Moscow accusing Washington of failing to rein in rebel militias, and insurgent commanders saying there is little point to the truce while Syria’s president, Bashar al-Assad, continues to block U.N. aid from reaching the besieged city of Aleppo. On Thursday, a Russian military spokesman accused the U.S. of covering up the actions of rebels it supports in Syria. "As of the third day (of the truce), only the Syrian army is observing the regime of silence," he said. "At the same time, the 'moderate opposition' led by the U.S. is increasing the amount of attacks on residential districts." The U.S. State Department also voiced skepticism about Russia’s level of commitment to the cease-fire, and said more time and effort would be needed to coordinate airstrikes and set up a joint command center. “I don't think that anyone in the U.S. government is necessarily taking at face value Russia's or certainly not the Syrian regime's commitment to this arrangement,'' State Department spokesman Mark Toner said. Toner, though, also said the only thing that really matters is President Barack Obama’s commitment to the deal. “Our system of government works in such a way that everyone follows what the president says,” he said. The immediate source of the dispute is the refusal of rebel factions to withdraw 500 meters from a key route into insurgent-controlled parts of Aleppo, the Castello Road. But rebel commanders told VOA they won’t do so until Syrian army and foreign Shi’ite militiamen drawn from Iran and other Mideast countries start pulling back too. Rebel anger is mounting about the cease-fire agreement — parts of which have not been published or divulged by Moscow and Washington. 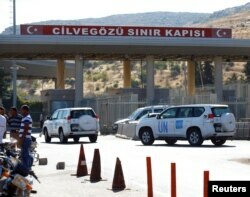 U.N. vehicles enter Syria from Turkey at Cilvegozu border gate, located opposite the Syrian commercial crossing point Bab al-Hawa in Reyhanli, Hatay province, Turkey, Sept. 16, 2016. But without humanitarian assistance happening, there is little purpose, as far as the rebels are concerned, for the cease-fire. “All it is doing is to strengthen Assad,” he says. The main U.S. motive for pushing for a cease-fire was a humanitarian one and to get aid into Aleppo and to other besieged areas of Syria. Aid agencies as well as the United Nations are ready to supply relief to an estimated six million people inside Syria, including 250,000 trapped in eastern Aleppo. The cease-fire deal is meant to allow for “unimpeded and sustained humanitarian access” to besieged areas. But as of Thursday, U.N. aid trucks have not been given the go-ahead by the Assad regime to enter northern Syria from Turkey. More than 20 trucks laden with food and medicine have been on the border between Turkey and Syria waiting for clearance from Damascus, which insists all aid must be approved first before crossing into the country. 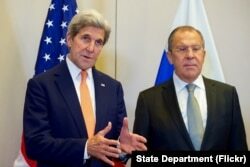 U.S. Secretary of State John Kerry, flanked by Russian Foreign Minister Sergey Lavrov, answers a reporter's question on Sept. 9, 2016, at the Hotel President Wilson in Geneva, Switzerland, before they begin a bilateral meeting focused on Syria. U.N. Special Envoy to Syria Staffan de Mistura, who says hundreds of trucks are ready to be loaded with aid, blamed Damascus for the delay — a hold-up that’s endangering the whole truce. He says the U.N. has not yet received facilitation letters from Damascus that would allow aid deliveries to begin. He also says the dispute over the Castello Road is complicating the aid issue. De Mistura says the blocking of aid is a clear breach of the cease-fire agreement. But despite the problems, the envoy told reporters that the Russian-American agreement “is and remains a potential game-changer” and has produced a reduction of violence, adding that “by and large it is holding and is, in fact, substantial”. Under the agreement struck between Washington and Moscow the warring sides are meant to step back from the Castello Road. Two checkpoints are then meant to be established on the road overseen by the Syrian Arab Red Crescent and with security provided by Russian soldiers. Rebels say they are not comfortable with giving up territory they have fought so hard to keep and which has seen considerable loss of rebel lives. “There is fear because the regime exploits every opportunity,” Malahefji said. Overall, the cease-fire has broadly held since coming into effect on Monday evening when the major three-day Muslim holiday, Eid al-Adha, started. Both rebels and the regime have accused each other of violating the truce. But monitoring groups have not reported civilian deaths since the cessation of hostilities went into effect — except in territory controlled by the jihadist Islamic State group, which is not covered by the cease-fire deal. The Syrian Observatory for Human Rights said at least 23 civilians, including nine children, were killed in an airstrike in the IS-held town of Mayadeen. It is unclear whether the strike was carried out by the Russians, the Syrian Air Force or the U.S.-led coalition.